Any variety of fish: 2 fillets, approximately 1/2 lb. First of all wash and drain fish fillets properly. Remove fillets into a bowl and let them cool. Then add in Onions, Ginger/Garlic Paste, Green Chilies, Cilantro, Salt, Red Chili Powder, Garam Masala & Lemon Juice. Mix well (sometimes cook use hands to mix well the mixture). Taste and adjust salt or other spices. Add in Egg Whites and mix well. Add in Bread Crumbs until it makes a nice patty with the mixture. Make patties with the mixture according to desired size. 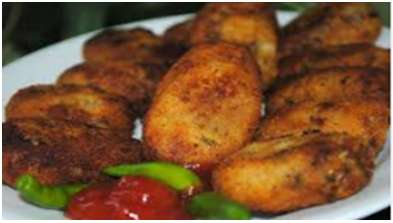 Fish cutlet is best choice of appetizer for people who love dishes of fish. It will definitely create good atmosphere and guest will relish eating delicious snack.